From the pattern and tutorial found at Make Your Own Baby Stuff, this is a shaped burp cloth with fun bump minky fabric on one side and monkey-print flannel on the other. I've made these before for baby shower gifts, they are so easy, just sew, turn and sew. I know, I know. PINK? 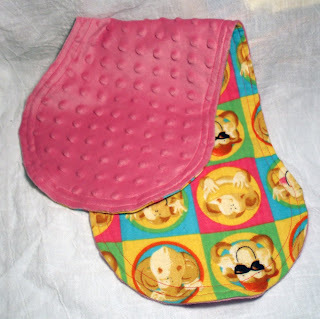 But I figure burp rags are more like an accessory for the mom, not the baby! So just roll with it!